The thin Lambswool long-sleeved sweater shown opposite costs £36.00. 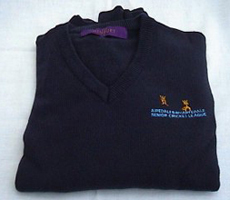 -Wharfedale Senior Cricket League with the lettering in Cambridge blue, so completing the League`s livery of Oxford blue, Cambridge blue and Gold. 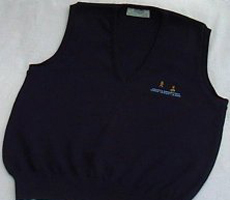 The slip-over, pictured above, is only £34.00. 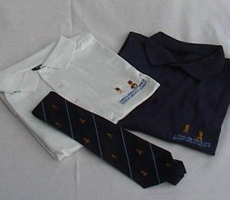 The final items, shown here are the League tie, costing £10.00, and Leisure polo shirts in blue or white, costing £12.00.